7-Inch ANDROID OS 4.0 Capacitive Multi-Touchscreen tablet 16:9, Access popular games and apps from the GetJar marketplace, All-in-1 device to browse the web, watch YouTube videos, check Email and much more, Plays popular internet video, music, and photo formats, E-Reader with access to thousands of books, 4GB Internal memory plus microSDHC memory card slot to store your music, photos, and videos, 512MB RAM for seamless multi-tasking, Wireless internet with Wi-Fi (802.11 b/g/n), Hours of use with rechargeable lithium-polymer battery, Screen resolution 800x480(WVGA). Connect to the world with the touch of a fingertip. The Coby KYROS MID7036-4 tablet is a powerful and flexible internet and entertainment solution with a 7.0-inch capacitive touch screen and intuitive Android 4.0 operating system (Ice-Cream Sandwich). Your time, your way with access to thousands of applications from GetJar marketplace with plenty of games, social media, and productivity tools to meet your needs. With sleek and stylish Coby tablets you are able to relax and enjoy your favorite music, e-Books and photos. 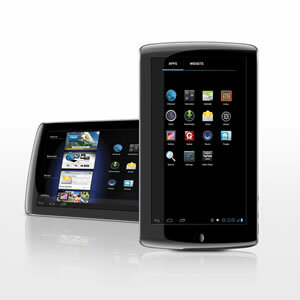 The Android 4.0 (Ice Cream Sandwich) operating system is the latest version of the Android platform for tablets and more. It builds on the things people love most about Android: easy multitasking, rich notifications, customizable home screens, resizable widgets, deep interactivity, and powerful new ways of communicating and sharing. With open access to GetJar, the world’s largest free app store, over 550,000 apps are only a touch away, giving you the freedom to customize your tablet for all of your web and entertainment needs. Multitasking is a key strength of Android and it's made even easier and more visual on Android 4.0. The Recent Apps button lets you jump instantly from one task to another using the list in the System Bar. The list pops up to show thumbnail images of apps used recently, and tapping a thumbnail switches to the app. At 10.4 ounces, the Coby tablet is remarkably light. Measuring 7.5 by 4.4 by 0.5 inches (W x H x D), this easy-to-grip tablet is designed to fit comfortably in your hand and travel with ease. Using your fingers is easy. 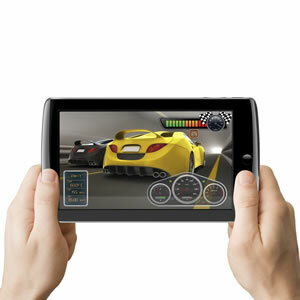 With capacitive, multi-touch technology, this tablet responds quickly and naturally to your touch. Interact directly with what's on the screen by pinching, tapping, dragging, or swiping. More than ever, the Web is part of our daily lives. We live in a connected world that allows us to laugh, share, and live on the web. The Coby tablet allows you to do the little things you love - shop, check the weather, get recipes, keep in touch with friends and family, and keep up with the constantly changing stocks and news. It lets you instantly sync and manage Google Chrome bookmarks from all of your accounts, jump to your favorite content faster, and even save it for reading later in case there's no network available. Now experience your personal web up close with a lightweight tablet that powers on instantly anywhere (Wi-Fi connection required). Emails are easy. Fire off an email from your couch. Or the kitchen. Or the yard. With the built-in email app, Coby tablets make it easy to stay in touch. In Android 4.0, email is easier to send, read, and manage. For composing email, improved auto-completion of recipients helps with finding and adding frequent contacts more quickly. For easier input of frequent text, you can now create quick responses and store them in the app, then enter them from a convenient menu when composing. When replying to a message, you can now toggle the message to Reply All and Forward without changing screens. For easier browsing across accounts and labels, the app adds an integrated menu of accounts and recent labels. To help you locate and organize IMAP and Exchange email, the Email app now supports nested mail subfolders, each with synchronization rules. You can also search across folders on the server, for faster results. Where and who you email with is up to you (Wi-Fi connection required). With all the things you can do with Coby tablets, don't forget to take a break for some music. The built-in music app lets you swipe and tap through your music by artist, album, song, or playlist. Listen to your favorite tunes at home or on-the-go. 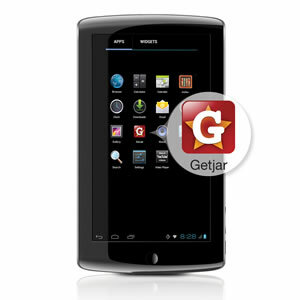 Take advantage of the most creative apps available for Android with the built-in accelerometer. From unique and exciting games to handy utility apps, you'll be amazed at what your tablet can do. To help organize appointments and events, an updated calendar app brings together personal, work, school, and social agendas. With user permission, other applications can contribute events to the calendar and manage reminders, for an integrated view across multiple calendar providers. The app is redesigned to let you manage events more easily. Calendars are color-coded and you can swipe left or right to change dates and pinch to zoom in or out agendas. Imagine a library in the palm of your hands. Our tablets let you access countless volumes of books including best sellers, new releases, classics, modern classics, and books from public libraries. The future of reading is here, and it fits comfortably in your hands. Whether it's for you or your loved ones, you'll find some great games in Coby's free Android App store. Browse and download thousands of the most popular apps. With puzzle, strategy, action, racing games and more, there's something for everyone. The MID7036-4 tablet comes with 4GB of on-board storage. Need more room for music, movies, or pictures? Just insert a microSD or microSDHC card and increase your memory up to 32GB. The right size is up to you.